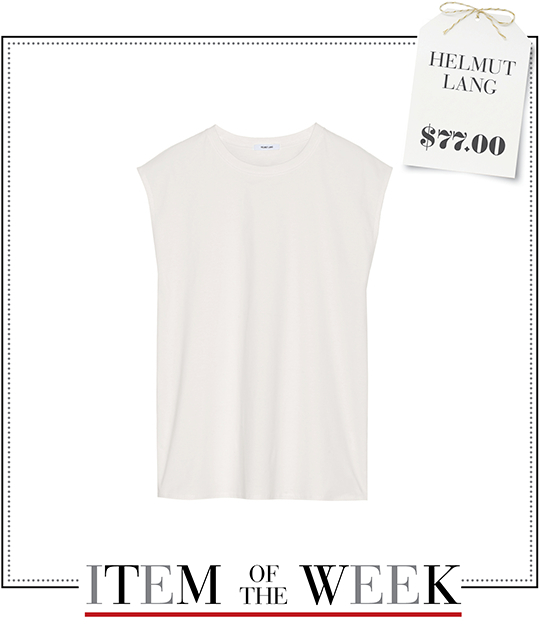 A loose-fit white cotton top from Helmut Lang. See how you can coordinate your wardrobe in 5 different ways with 1 item, under $100. Monday Dinner Plan: On a night out to eat, try wearing this week's white sleeveless top with a pair of sleek leather pants and a tailored black coat. To make this outfit more edgy and bold, try accessorizing with a leopard-print tote, pointy d'Orsay pumps, apex studs, fruity fragrance, and red lip gloss. Tuesday Casual: Give your off-duty style a dashing update. 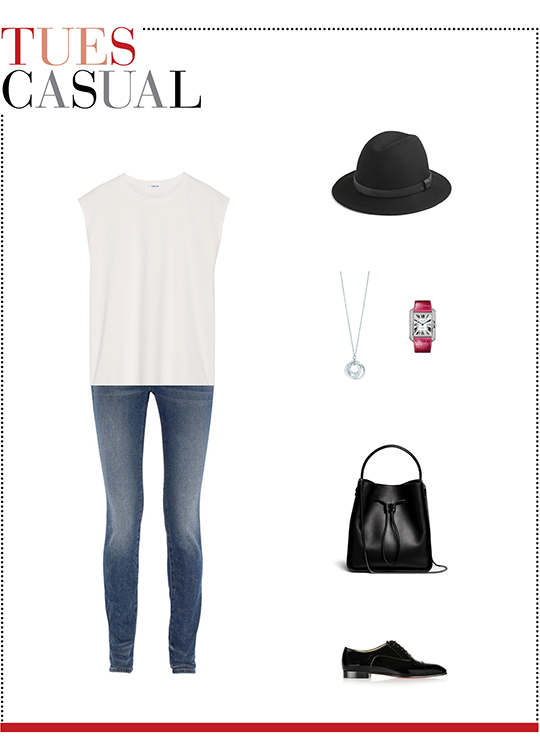 Build a relaxing and tomboyish outfit with a pair of high-rise skinny jeans, a classic felt fedora, a circles pendant necklace, a pink leather watch, a black drawstring bucket bag, patent Oxfords, and the Helmut Lang top. 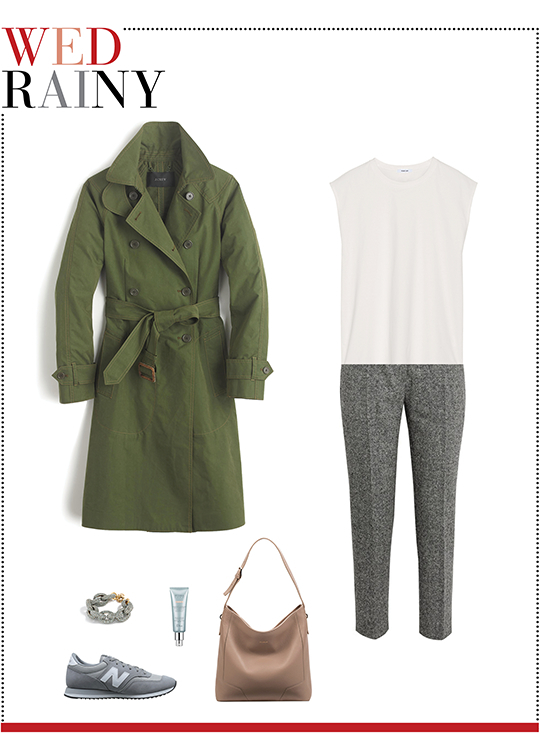 Wednesday Rainy: Trench coat season is here so prep yourself for those rainy autumn days. Pair this utilitarian outerwear with the white cotton top and cropped wool-tweed pants to create a chic wet weather ensemble. Add comfy gray sneakers and a camel hobo bag to accessorize your look. Finish the look with a link bracelet and some BB cream. Thursday Date Night: A pleated midi skirt is your new style savior and today's shimmery black-silver bottom will make your date night look shine. Wear it with this week's Helmut Lang top then grab a metallic shoulder bag and matching studded flats. Last but not least, reuse Monday's red lip gloss and add a few jewelry pieces like a pearl ear cuff and a diamond bow ring. Friday Office-friendly: Need a confidence booster at work? Use these office-appropriate items and you're guaranteed to succeed. A suede pencil skirt, a taupe trapeze tote, mauve patent pumps, and a gold diamond ring will give your work attire a sophisticated update. Complete your outfit with this week's top, Monday's apex studs, and fruity fragrance.